I finally made up my mind on the new project, just in time for the three day weekend! 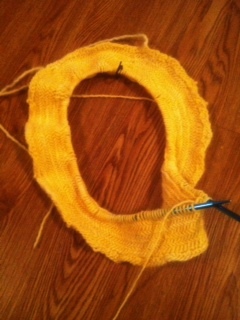 Enter Purlbee’s Big Herringbone Cowl. To fill you in, I bought the materials for this a year ago. Yarnivore, one of the local yarn sources around here, was holding classes to make this beautiful cowl. I chickened out at the last minute and stayed in. I didn’t think I could do this. A year later, I know I can do this. Unfortunately, my largest circular needles are size 10. I decided (hopefully I won’t regret this) to go forward on the project after a few measurements. The cowl won’t be the same size, but I think it’ll work out. It’s a little rough around the edges. I had a little trouble working out the herringbone stitch pattern. I decided it wasn’t worth it to frog nearly 500 stitches just to fix this. The yarn is Malabrigo worsted weight and the gorgeous yellow colour is called pollen. I absolutely love it. As if it wasn’t soft as yarn, it’s even softer knit up. Now, of course, my little brother wants a bearded toque. when does he want it? Next Saturday. W00t for impossible deadlines! Well, not maybe not impossible. We’ll see.